The hardest part of a hurricane is often the recovery after it passes. It takes time to rebuild, restore power, and restore water, and that time drags on when you find yourself enduring the Florida heat. 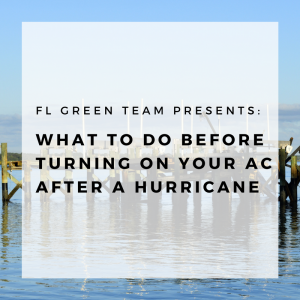 It gets to the point where you yearn for AC, but the experts at FL Green Team highly recommend you take your time to check your unit prior to turning it back on. When the power is restored, make sure you follow the process below to ensure your HVAC system is safe to turn on. Outdoor units are extremely vulnerable because they are exposed to the elements and debris when the hurricane hits. 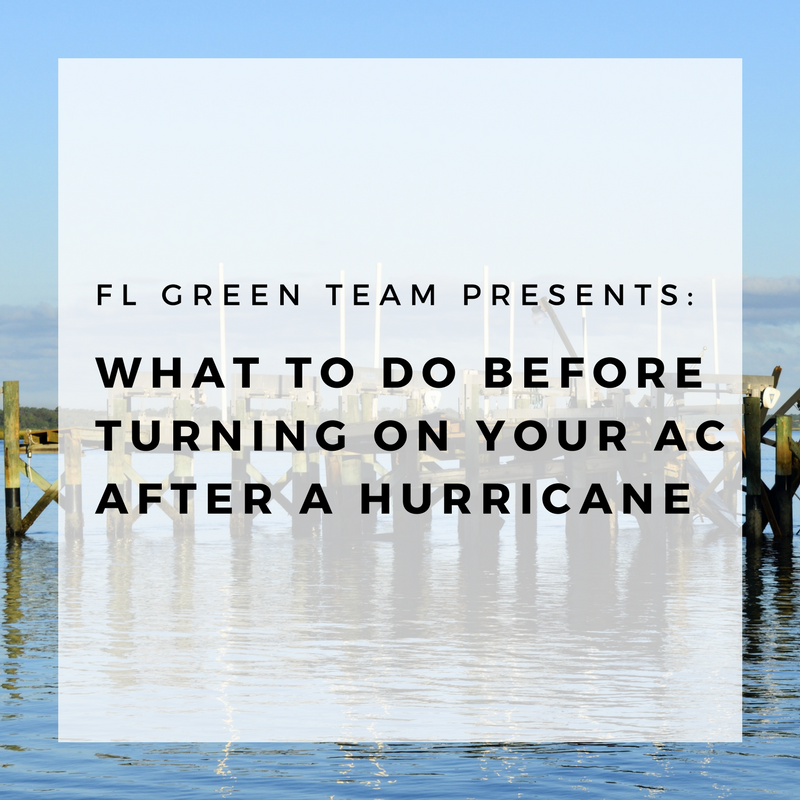 That is why it’s important that you include your AC unit in your hurricane preparation plan. For future reference, you can use hurricane straps to hold your unit in place against high winds and plywood to protect it from debris. Can you see debris sticking out of the unit, such as fallen limbs or windblown objects? Are the vents and cooling fan clear? Is the unit submerged in water? Are the electrical and refrigerant lines still connected? Can you see any electrical burn marks? Even if a unit is no longer submerged in water, you can typically tell if it was through dirt stains or caked mud that would show up on the exterior. If you notice any damage whatsoever to your unit, be it exposure to water or physical damage, always call a licensed and certified technician to inspect it prior to turning the unit on. If you turn on your system while it is damaged, you can risk electrical shortages, further damages, or inefficient operation. This advice also goes for indoor furnaces or air handlers. If either of these have been exposed to water, always call a professional for an inspection prior to turning them back on. What If I Can’t See My System’s Damage? 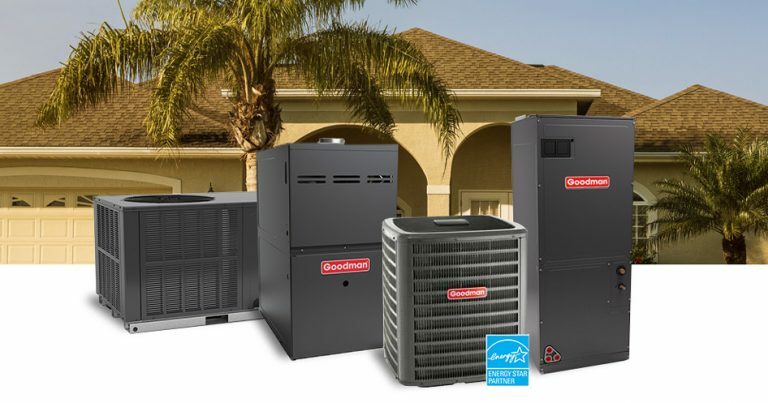 It is very possible that your AC unit or HVAC system incurred damage during a hurricane that isn’t visible to the naked eye. If you haven’t spotted any damage in your initial inspection, turn on your system but watch it very carefully. Inspect your unit again while it’s running to see if it emits any strange smells, smoke, or sounds. You’ll want to make this inspection a couple of times just to make sure everything’s running smoothly. If you find your system is running just fine, then you have no reason for concern. However, if you see, hear, smell, or experience anything that gives you doubts, call a professional. It is better to have positive results after an inspection than to take a risk and have your system break down. Are you a resident of Southwest Florida looking for an excellent AC technician to inspect your unit after Hurricane Irma? If so, contact a FL Green Team representative today at 239.432.1500! We serve residents across Charlotte, Collier, and Lee Counties.